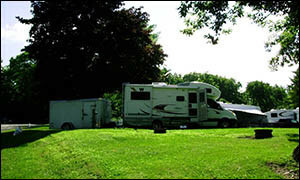 Cheerful Valley has a campsite for everyone, we have 125 RV sites available with all types of hook-ups, ranging from 20 amp electric and water to Big Rig 50 amp full hook-up. 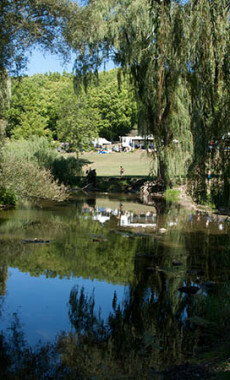 We also have tent sites for those that prefer the “back to nature” approach. We offer clean, modern restrooms to all of our guests (FREE) including the hot showers and to keep you from having all that work to do when you get back home, we have great laundry facilities, too! Aside from the outstanding fishing in the Canandaigua outlet, the expanses of grass-covered meadows provide the perfect place for volleyball and other lawn games. There are also a wide range of activities that cover everyone’s ideas of fun; relax in the extra large swimming pool, play horseshoes or shuffleboard, or get some exercise in a friendly game of basketball. So much to do, and if those aren’t appealing to you, come check out the games going on in the Game Room or plan on a Vintage Fire Truck ride. In case you forgot anything, we have a full-service camp store ready for you! We offer a Party Pavilion where we are known to hold everything from DJ dance, Strawberry and Ice Cream Socials, Wine Tastings, and all out game days! This is a great place to meet new friends, and meet up with old ones. There’s always fun to be had at Cheerful Valley Campground!